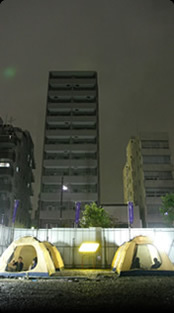 Before the building construction starts, almost all of Tokyoﾕs clear space is usually utilized as coin parking area. We, in order to give diversity to the functions of the city, planned the parking for the people, rather than the cars. By staying in a clear space rather than the nature, we re-discover the lure of the city. It fuses together coin parking and camping, and it is possible to stay with 100 yen per hour; this serves as the experiment of the life style of pay-as-you-go for the urban population.